Some of the Zanu-PF party supporters who thronged Filabusi Business Centre for a rally addressed by Vice President Constantino Chiwenga (INSET) yesterday. He was referring to a demonstration by the MDC-Alliance in Harare on Wednesday to force ZEC to implement so-called electoral demands. Vice President Chiwenga addressing a Zanu-PF rally at Dingimuzi stadium in Plumtree town yesterday. 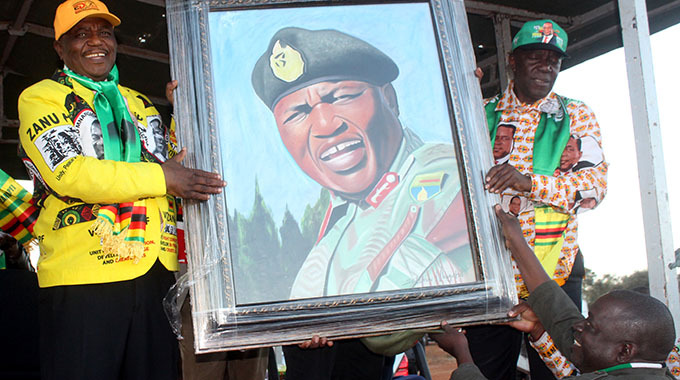 Vice President Chiwenga receives a present from Umzingwane constituency member of parliament Cde William Dhewa after his address during a rally in Filabusi, Insiza district yesterday. “I think you heard the issue of devolution; it was a contentious issue during the constitution making process but ours is not about creating a separate state. Zimbabwe is a unitary state. It will remain united because from here in Plumtree to Mutare, from Victoria Falls to Chipinge, we are one people. We may differ on customs, cultures and languages,” the VP said. VP Chiwenga outlined the economic plans for Plumtree and said the town must be upgraded to Municipality status. 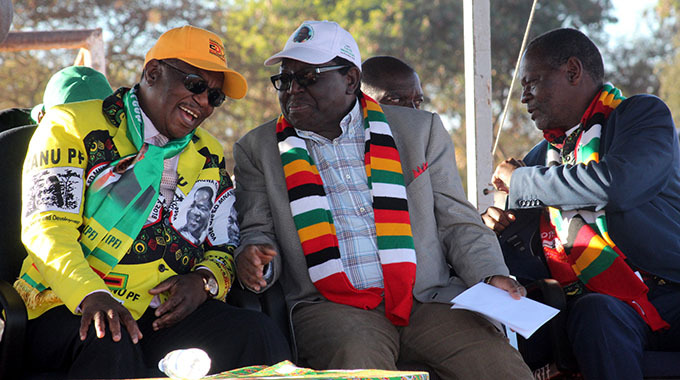 Vice President Chiwenga and Zanu PF spokesperson Cde Simon Khaya Moyo share a lighter moment at a Zanu PF rally held in Filabusi, Insiza district yesterday. On the right is the Matebeleland South minister of state for provincial affairs Cde Abednico Ncube. “Here in Mat South, you have coal, diamonds and livestock rearing. Here in Plumtree we are going to have an inland port and the wealth from this province will develop this area. Plumtree was a town but you have qualified to be a Municipality because the town has grown through economic development found around here,” said the VP. He said areas around Plumtree face perennial water shortages as well as schools, clinics and bad roads and Government was working on addressing those issues. “There are many clinics that have to be constructed in Bulilima and Mangwe. But our top priority is the District Hospital in Mangwe. A maternity wing has to be set up at Dingumuzi clinic to cater for women as Government has scrapped maternity fees to ensure that all women go to a health centre for antenatal care,” said the VP. VP Chiwenga said Government would work on equipping Plumtree District Hospital and provide drugs so that those that are referred to it get the satisfactory service. He said the issue of staff accommodation should also be prioritised and said a school of nursing should be set up at Brunapeg to also recruit locals. VP Chiwenga said they were also prioritizing the construction of roads and on top of the list are the Plumtree – Tshitsi-Mpoengs, Dombodema-Maitengwe and the Plumtree-Tsholotsho. “We are looking at the roads. They are in a bad state. Some need to be gravelled, some patching and some to be tarred,” he said. The VP said more dams would be constructed countrywide and in Plumtree district namely Tematema and Nanda dams. VP Chiwenga said people would also benefit from the Command livestock programme which he launched in February. He urged party supporters to vote for Zanu-PF’s presidential candidate Cde Emmerson Mnangagwa whom he described as a hardworking man with a vision for a new Zimbabwe. The VP also urged supporters to vote for National Assembly members Mangaliso Ndlovu, Dingumuzi Phuthi and Obedingwa Mguni and local authority candidates. VP Chiwenga was accompanied by the Matabeleland South Zanu PF leadership namely Politburo member and party spokesperson Cde Simon Khaya Moyo, Minister of State for Provincial Affairs, Cde Abednico Ncube, provincial chairperson Cde Rabelang Choeni, national deputy Commissar Cde Omega Hungwe, among others. 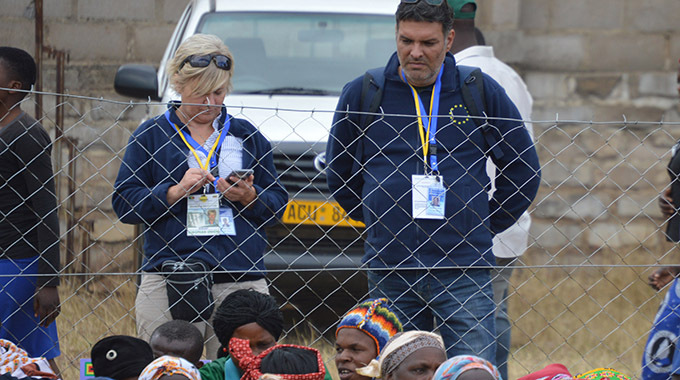 Meanwhile, villagers from Silalatshani under Chief Sibasa in Insiza are free to continue farming without worrying about Zimbabwe National Water Authority debts which were carried over from the bearer’s cheque era, VP Chiwenga has said. 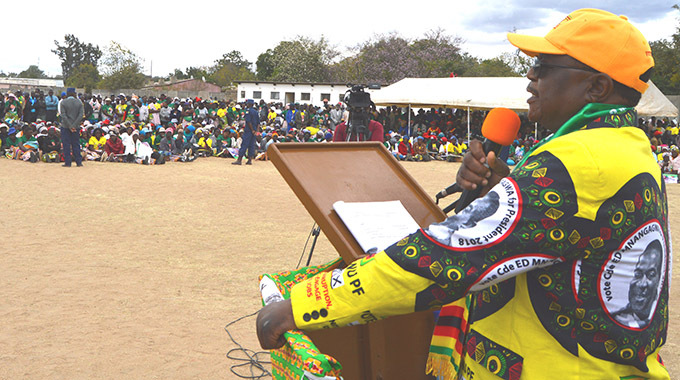 Addressing hundreds of people at Filabusi Centre during a rally yesterday, Cde Chiwenga said Zinwa also had no power over fisheries which are to be managed by villagers. He said Government has scrapped off their debts and therefore no one should demand payments or cut off their water supplies. “We heard that villagers are being forced to pay thousands of dollars as debts carried over from that era. This should stop immediately and villagers should go and farm freely knowing that they do not owe Zinwa,” he said to applause. VP Chiwenga said Government had been working tirelessly to foster development since November last year when citizens stood up for economic revival.